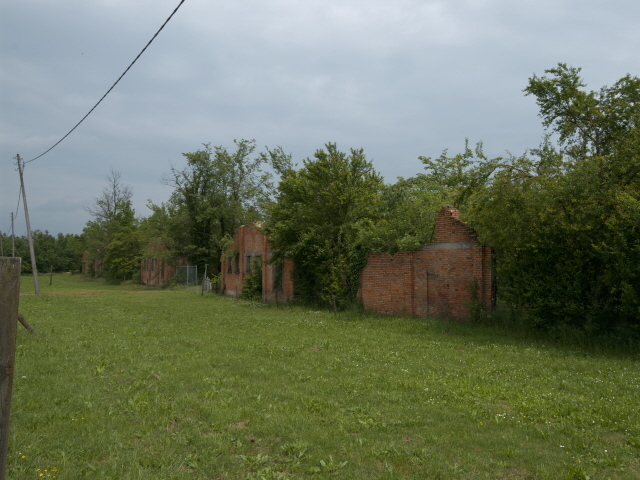 The site of a concentration camp/transit camp, near the small town of Carpi in the Emilia-Romagna region, through which a large proportion of Italy's Holocaust victims were deported to Auschwitz or other camps. Remarkably, much of the brick barracks is still standing, albeit largely derelict, but the site is being preserved as a very special memorial. More background info: While there was anti-Semitic oppression in Italian Fascism too, Jews were nevertheless much safer within Italy and its sphere of influence than anywhere in Germany or territories under Nazi control during WWII. Mussolini may have been a similarly ruthless dictator as Hitler, but he didn't share or actively participate in the Nazis' programme of extermination of European Jewry (the “final solution”). From September 1943 Nazi Germany occupied the northern half to two thirds of Italy too and not only put up fierce resistance against the advancing Allies (cf. San Pietro Infine) but also retaliated against the Italian resistance … and: grabbed the opportunity of suddenly having “access” to Italy's Jews too. Within weeks the round-ups and deportations to the east began – see under Shoah Memorial, Milan! The first couple of deportation trains went straight to Auschwitz, but then the Nazis preferred to first assemble the victims in so-called transit camps (“Durchgangslager”) before sending them on larger onward deportations by train. Fossoli became one of the most important such camps in Italy – so it was basically a concentration camp, just that the inmates didn't stay long but were sent on. See also Westerbork or Drancy. Initially, Fossoli had been set up in 1942 as a POW camp (mainly for British soldiers who had been taken prisoner in North Africa), but from September 1943 it housed mainly political prisoners and Italian soldiers who refused to co-operate with the new masters. Next to the first mostly tented camp new solid barracks were then constructed from bricks. Not much later, from December it became the main concentration and transit camp for Jewish victims from late 1943 and all through the first half of 1944. In total about 3000 Jewish victims are believed to have passed through Fossoli in the Holocaust. Most of these were sent on to Auschwitz-Birkenau (but also Bergen-Belsen), whereas the political prisoners were primarily sent to Mauthausen or Flossenbürg (and women to Ravensbrück), roughly 2000 in total. At the site itself, not so many died (that was left to the gas chambers elsewhere) but there was at least one incident in which the Nazis massacred several dozen prisoners in retaliation for some act of resistance. As the Allies pushed the front northwards and were getting closer to Fossoli from mid-1944, the transit camp here was given up and a similar camp near Bolzano (Bozen) further north in the Alpine region of South Tyrol took over the main role of transit camp until the end of WWII. After WWII the older part of the Fossoli camp was reclaimed for agriculture. But the newer part, that with the brick barracks, continued to be used as a refugee camp, first for both Holocaust survivors and IDPs, later for Italians resettling from formerly Italian (or Italian-controlled) territories that had become part of Tito's Yugoslavia, in the 1950s. For a short period the Fossoli camp had even been taken over by the Christian, social utopian youth organization Commune Nomadelfia. The camp ceased functioning in any such way in the early 1970s when the former deportee association of Carpi set up the museum in that nearby town; the grounds of the camp were later acquired in the 1980s and turned into a memorial in the 1990s under the umbrella of the Fondazione Ex-Campo Fossoli. By that time most of the brick barracks had already fallen into dereliction, the roofs had all collapsed and trees and plants had taken root all over the place, but the brick walls of most of the barracks are still mostly standing today. Meanwhile some paths have been cleared, information panels put up and one of the barracks has even been completely reconstructed and now houses a small exhibition. More work on further developing the memorial site continues. What there is to see: From the fence by the car park, which stretches along the western side of the site, you can see several of the derelict brick barracks … but little more that that. By the main gate there is one large panel that has some historical background and further info, including in English (though rather embarrassingly poor English in places – fancy “prisoners designed [sic!] for Auschwitz” … clearly they must have meant “destined”, but seriously, how could such a severe error have slipped through!?!). Yet more info panels could be spotted further inside the site along the paths that had been cleared of undergrowth, but obviously from the fence these were too far away for me to be able to read anything on them. On the fence itself, however, there was a small sign with QR code for smartphone users to download more info (see photo gallery). And at the time I was at the site (May 2015) yet another sign also announced some temporary exhibition. This may well have been in the one barrack that has been fully reconstructed – and in fact looks brand new. Inside there is supposed to be a new small exhibition too about the Fossoli camp and the Holocaust in Italy. But unfortunately I could not see this. I had tried to arrange a guided tour in advance but that failed (my emails never received a response – see below). And at the time I arrived at the site at midday on a Sunday it was closed for lunch. I couldn't afford to wait until they reopened because I had to make it back to Milan to return my hire car and get on my flight back home. So I can't report anything else first-hand. But I will try again next time I'm in the area (there are other reasons for me to come back to this part of Italy, so it might actually happen). For the time being, though, I have to leave it at this. Location: some 4 miles (6 km) north of Carpi, in the Emilia-Romagna region of northern Italy. Official address: 13A, Via Remesina Esterna. Access and costs: rather restricted; free to see from the outside but guided tours are not necessarily cheap. Details: To get to the site independently you really need you own means of transport, be it motorized or by bicycle (I saw a large group of cyclists waiting outside when I was there, so it does seem to be compatible with cycling holidays as well). You could in theory also get there on foot from Carpi if you don't mind a ca. one hour walk from the town centre along mostly boring rural roads. From Carpi's northern edge it's more or less a straight line up on Via Remesina. The former camp is on the right and there is a sufficiently large car park with spaces for about two dozen cars or so. From there you can look through the fence at the mostly derelict camp barracks. But to get access to the paths between them and to the reconstructed barrack with the exhibition you have to either arrange for a guided tour or be there on a Sunday for the very limited regular opening times: 10 a.m. to 12:30 and 3-7 p.m. (in summer – in winter from 2:30 to 5 p.m. only). Closed in August and December! As I understood it, the site opens it doors for independent visitors at these times now possibly without charging an admission fee. There may even be free guided tours then (the different sources I found aren't totally clear on all that). Guided tours by the Fossoli Foundation at any other time have to be requested in advance and are charged a fee (how much I could not find out). I actually tried to arrange this by writing (in English) to their general email address fondazione.fossoli(at)carpidiem.it, in fact twice, and a couple of weeks ahead of my visit. But I never had a reply. So good luck. It may help if you can write in Italian. Time required: between just a few minutes for viewing the site from the outside to a couple of hours on a guided tour. Combinations with other dark destinations: The town of Carpi just south of Fossoli has an associated Museum of Deportation that is run by the same foundation as the old camp memorial. This is obviously the most significant combination. To see a new and impressive memorial at the origin of many of the transports to Fossoli check out the Shoah Memorial at the Central Station of Milan! They even have a four-carriage deportation train on display. A bit closer in the other direction, Bologna offers dark sites of mostly very different kinds but makes an ideal base for exploring the region, including Carpi and Fossoli but also a few further more rural sites. Combinations with non-dark destinations: see under Carpi deportation museum.